Below suggestions are independent of the authors of PuTTY. They are not to be seen as endorsements by the PuTTY project. You can download Bitvise SSH Server here. Is Bitvise affiliated with PuTTY? Bitvise is not affiliated with PuTTY. We develop our SSH Server for Windows, which is compatible with PuTTY. Many PuTTY users are therefore our users as well. From time to time, they need to find the PuTTY download link. 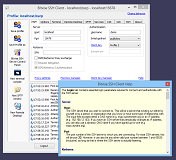 We also provide an SSH Client for Windows which is not a version of PuTTY, but is free and dedicatedly maintained. Many PuTTY users like our SSH Client as well. How did Bitvise acquire this domain? Bitvise was not the original registrant of putty.org. We purchased it from a previous owner who used it in ways unrelated to software. We thought it useful to repurpose it the way you see.